M.J. Rowles. Stockists of building & landscaping supplies, Illawarra & Shoalhaven. We stock a huge range of sand, soil, mulches, & road base. 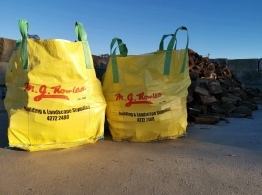 Established in 1948, M J Rowles are a family based business and we pride ourselves on our customer service, we strive to provide that ‘personal attention’ that is often forgotten in this busy world. We also stock fresh cut, locally grown Sir Walter Buffalo and Eureka Kikuyu, and carry a comprehensive range of tools and blocks for bricklaying, landscaping and rendering. We have four huge yards, so wherever you are we are close at hand to drop in and load up. 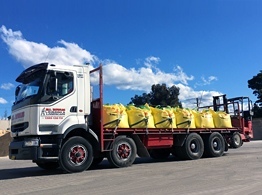 We also deliver in various sized trucks from Helensburgh to Ulladulla, so wherever you are on the South Coast you can call M J Rowles for your building and landscaping requirements. A variety of soils for all your Gardening, planting and Turfing Needs. Most commonly used for drainage, concreting, under slabs or even fill. Supplied by TurfCo, we can organise deliveries or pick ups of the Turf you need. Common bricks, exposure grade commons and dry pressed ‘solid’ commons for all building projects. Unique precast concrete products, perfect for landscaping and commercial property. To cover all forms of bricklaying, tiling, rendering and even kids sand pits! Smooth and rounded assorted pebbled for decrative purposes. A natural alternative to pebbles, both for decretive use or for easy to maintain gardens. Precast concrete products, perfect for landscaping and commercial property. A wide assortment of different Cements and Dry Mixes for multiple applications. If it can be found in a quarry we can get it for you! Seasoned, mixed species of Australian Hardwood which is already split for immediate use. Provided by Baines Masonry who we have teamed up with for a great range. Precast concrete products for commercial property use. 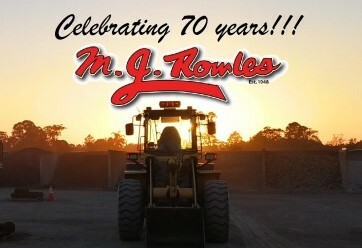 MJ Rowles is one of the largest distributors of building and landscape supplies in NSW. With an extensive fleet of vehicles and locations, you can be assured MJ Rowles can assist you in all your building and landscape supply needs. To find out more, call us on 02 4272 2488. Alternatively visit your local retail centre.